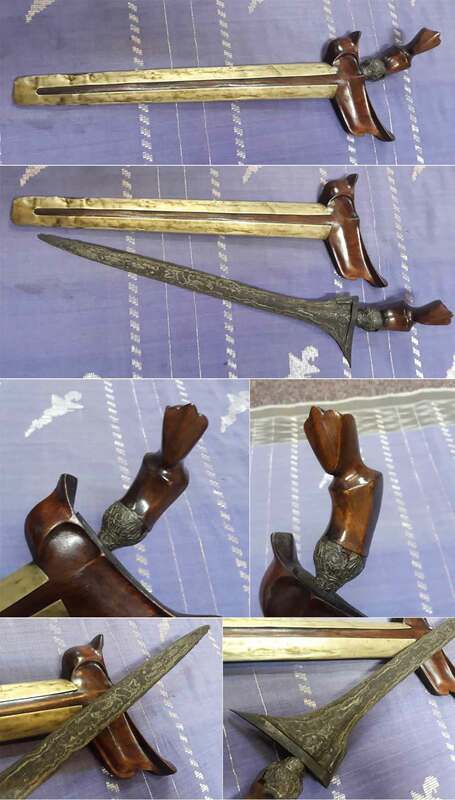 Keris Palembang Lurus Tilam Upih 0718. Keris Palembang Lurus Tilam Upih 0718 - A good eexample of a Palembang, South Sumatran keris. The typical regional form of handle in a human figurine like form, and the top sheath are made of hard and well selected kemuning woods with natural flashing grains, with the bottom stem made of angsena woods having a pin brass stem cover or pendok blewah. A repoussed silver ferrule or pendongko completes fittings. Straight blade with rather plain base features or perabots, has an overall shape or dapor called tilam upih. Pamor patterns are condense and are well arranged in the mlumah technique of the wos utah or scattered rice. It is said to enhance the owner’s material well being. Age: Krises are traditionally made without any date stampings or engravings of the makers' name. Although a kris smith or "empu" has his own styles configured together with the dapor and especially the ganjar (cross piece). Obvious age wear and tear, usage, familiarity with forms, motifs and designs, origin and history, mediums and materials used are our guidelines in determining an approximate age. This particular piece, from our experience and knowledge, should go back to the late 19th century. Length of blade: 14". Overall length: 18".